I got in a debate with somebody over on my website recently. I posted my opinion on pirating or stealing plugins. I made the argument that doing so will actually make your mixes worse instead of better. I say that because so many people will see a tutorial video by a big-name mixing engineer, and they will notice that this mixing engineer is using a specific plugin bundle. They then jump to assuming that the reason that this person makes fantastic sounding mixes is BECAUSE he uses this specific plugin bundle. Even if you aren’t pirating plugins, and you are spending your hard-earned money on them, you may still be spinning your wheels. Do people like Dave Pensado and Chris Lord Alge use stock plugins? Probably not. Does that mean you can’t learn how to get fantastic mixes with stock plugins? Absolutely not. Professional mixers are professional mixers because of their mixing skills. If you sit down with Dave Pensado and force him at gun-point to only use stock plugins when he mixes, guess what? His mixes will still sound awesome and will probably sound better than your mixes or my mixes. It ain’t the plugins, honey. It’s the countless hours he has spent honing his craft over the last several decades. Experience doesn’t cost nearly as much as a plugin bundle. In many cases, it’s free. 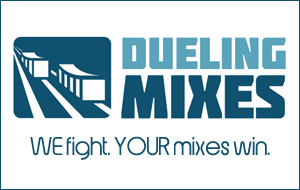 Or in the case of Dueling Mixes, it’s VERY affordable. Sign up today. Start mixing a song tonight. Do that for the next six months, and I guarantee your mixes will improve dramatically.